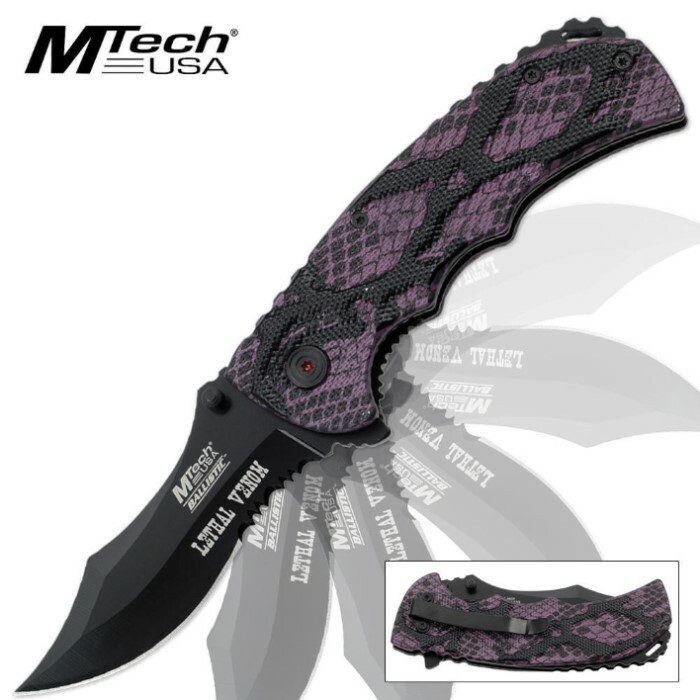 MTech Ballistic Lethal Venom Assisted Open Folding Pocket Knife Snake Skin Camo | BUDK.com - Knives & Swords At The Lowest Prices! The Lethal Venom Ballistic folding pocket knife features a razor-sharp, modified clip point blade that deploys as fast as a viper strikes with the powerful assisted-opening mechanism. The partially serrated blade features a non-reflective black finish, and the aluminum handle has an eye-catching purple snakeskin camo pattern, giving you a unique folding pocket knife that will get some attention. Includes pocket clip.